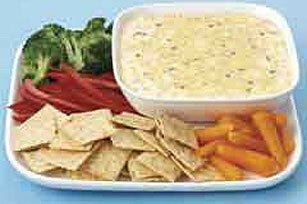 Dip into our VELVEETA Southwestern Corn Dip recipe! Party guests will love this corn dip recipe with its creaminess and Southwestern jalapeño kick. Mix VELVEETA and corn in large microwaveable bowl. Microwave on HIGH 5 min. or until VELVEETA is completely melted, stirring after 3 min. Stir in remaining ingredients. Save the seeds from 1 of the jalapenos and add to the dip. Or if you like it really fiery, no need to seed the peppers at all - simply slice off the stems and chop. Mix ingredients as directed in 1-qt. microwaveable bowl, cutting all ingredients in half. Microwave on HIGH 3 to 4 min. or until VELVEETA is completely melted, stirring after 2 min. Serve as directed. Makes 1-1/2 cups or 12 servings, 2 Tbsp. each. Makes 3-1/2 cups or 28 servings, 2 Tbsp. each.